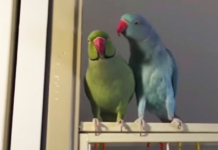 Hidden Camera Captures Parrot Doing THIS When Owners Were Not Around! Shocking! Parrots can be really unpredictable. Even though we know that they are capable of imitating human language and using it to converse with us, what they would say next is totally out of our knowledge. Take this parrot in the video below for an instance! What this parrot does when he thinks no one is around is going to leave you laughing out loud. It is kind of scary as well! This parrot apparently has the best laugh ever! 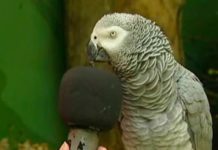 His parents probably love to laugh and have fun, which is why this parrot has learned to imitate their laugh perfectly. At first I thought it was his owner who was laughing in the camera, but when I realized it was actually this parrot, I couldn’t help but laugh.